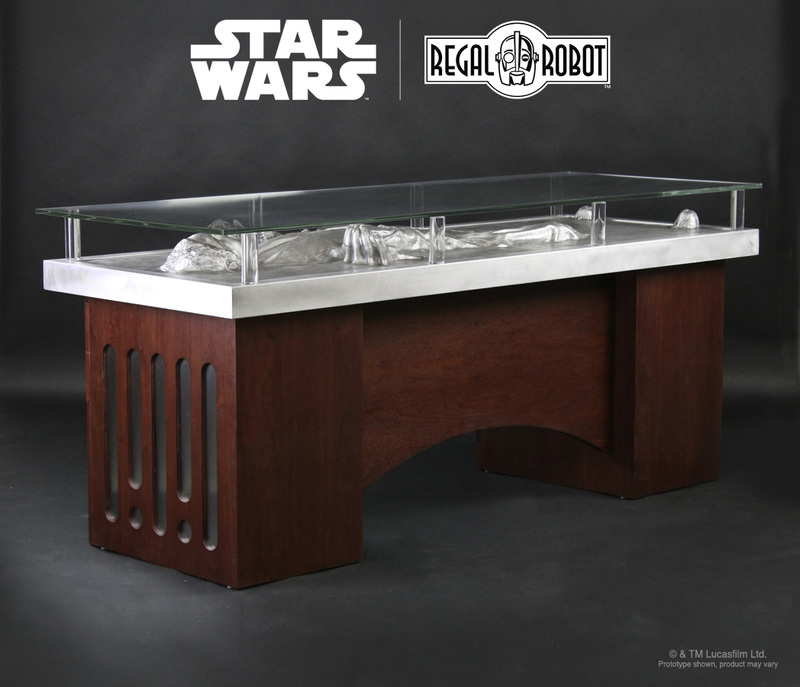 Regal Robot is proud to present Han Solo™ Carbonite Desk, the premier product in our “Elements” collection, which will feature beautiful products that combine the timeless looks of stained wood, metal, stone or glass with imaginative inspiration from the Star Wars ™ universe. 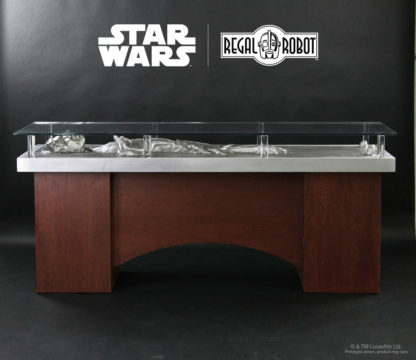 The desk features a life-size recreation of Han Solo™ encased in carbonite, topped with an sleek 1/2” glass table top. The rich stain of the wooden base provides a striking contrast to the aluminum metal and glass accents of the desk. 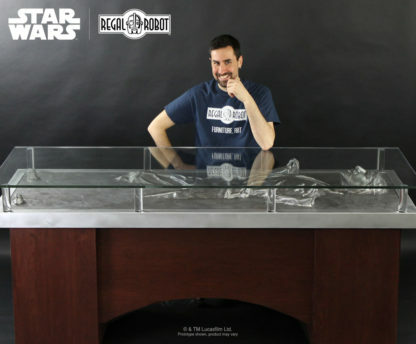 The tall desk has a top surface height of approximately 34.5″ tall, with 26″ of leg clearance. 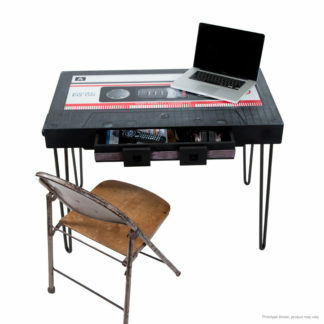 The spacious desk top is approximately 78.75” by 29.25”, to provide ample workspace. The desk also features a tower cabinet with adjustable shelf within, and three drawers to provide plenty of storage, perfect for any home, office or workspace. About 10 years ago, our company founders created the infamous original Han Solo™ in Carbonite desk for a Grammy award winning musician to auction for charity. 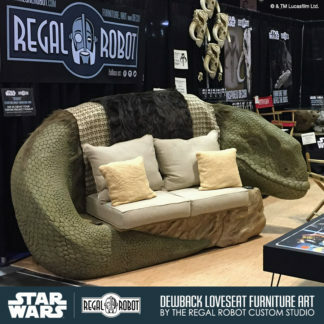 The internet’s reaction was nothing short of explosive, and it lead them push in this new design direction, combining high end sculpting and art with function and furniture. 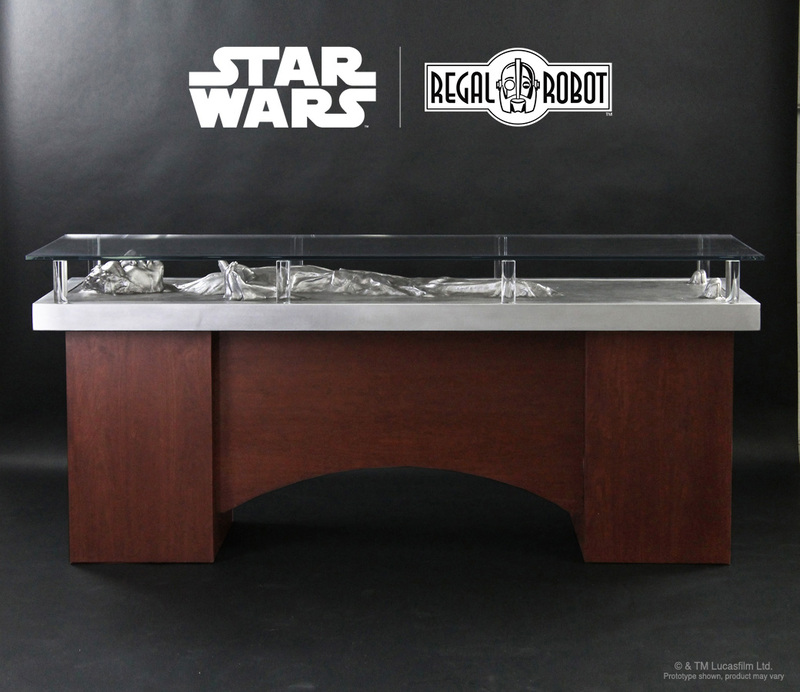 Today, Regal Robot is proud to present a reimagined version of one of our most popular design, the new Han Solo™ Carbonite Desk. The newly designed executive style desk features a modern combination of rich mahogany stained walnut with metal and glass accents, to bring a stylish design to one of the most wanted objects (and characters!) in the entire Star Wars universe. The fiberglass and aluminum Han Solo™ section was recreated with a combination of mold and cast items and 3D printed details scanned from the original film prop. These elements were brought together by hand, with additional hand sculpting to create a faithful, but unique interpretation of the frozen smuggler. The dot-dash cut outs on either pedestal expose brushed aluminum laminate. These modern design features also evoke the carbonite chamber in Star Wars: The Empire Strikes Back™. 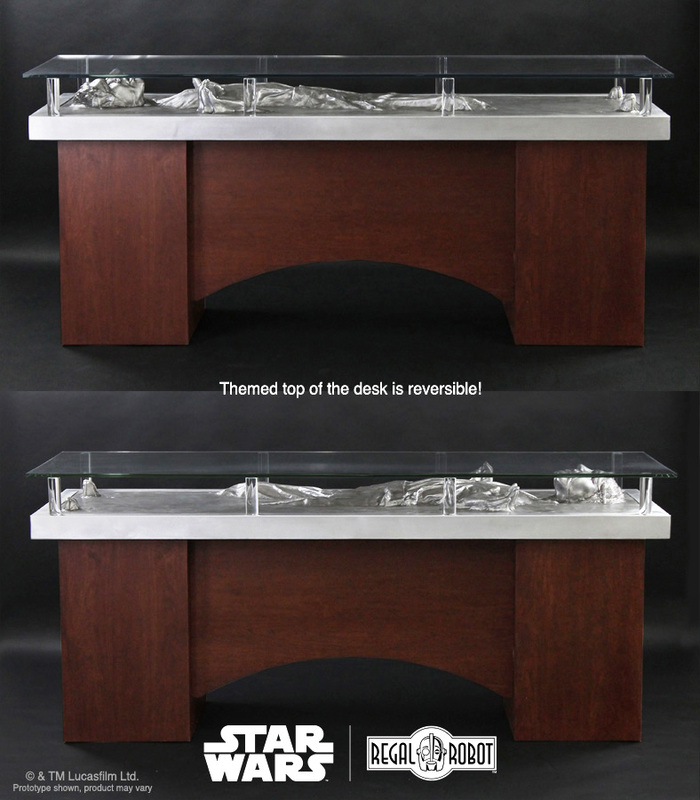 One of the most important features of the Han Solo™ Carbonite Desk is its combination of both functionality and style. The tall desk has a top surface height of approximately 34.5″ tall, with 26″ of leg clearance. 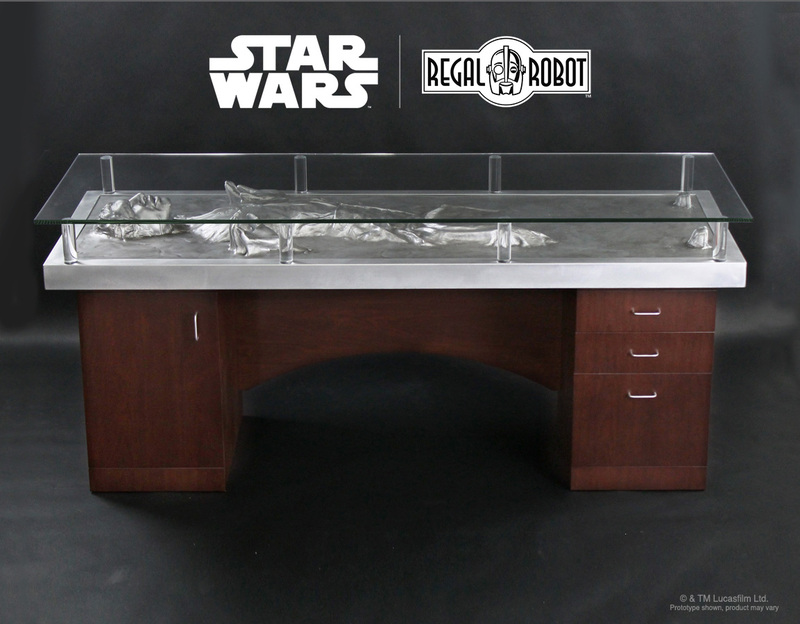 Supported on eight 1.5″ diameter acrylic rods, the polished edge glass top ensures that the spacious 78.75″ x 29.25” desk has generous workspace. 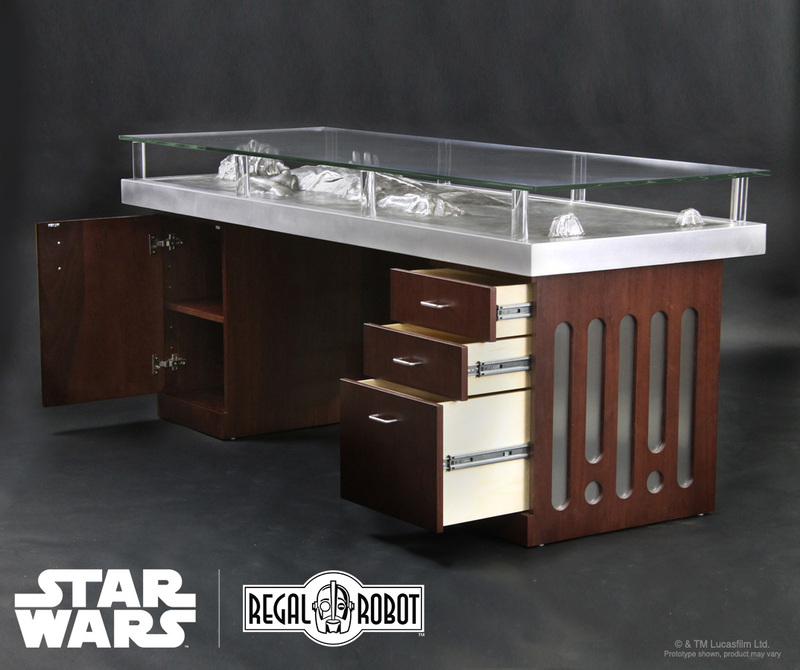 The desk also features a storage cabinet with adjustable shelf and three drawers (including a file sized drawer) with baltic birch interiors that provide plenty of storage for a computer tower, office supplies, documents or even any important Star Wars collectibles. 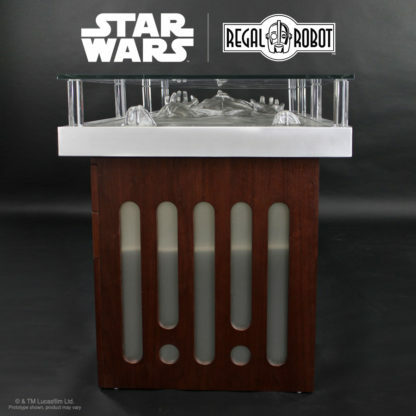 The drawer pulls also borrow their style from handles seen on the original carbonite prop for an elegant design feature as well as a subtle nod for fans in the know. The front modesty panel and the tower cabinet both feature grommets to allow easier maneuverability of computer or phone cables. 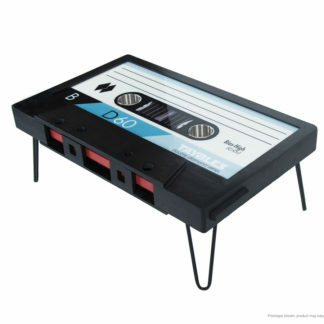 The top of the desk is reversible so the head can face either direction, making it customizable for your space. 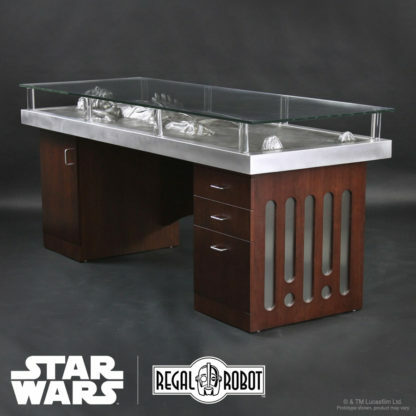 This incredible item is both a desk and a beautiful piece art. 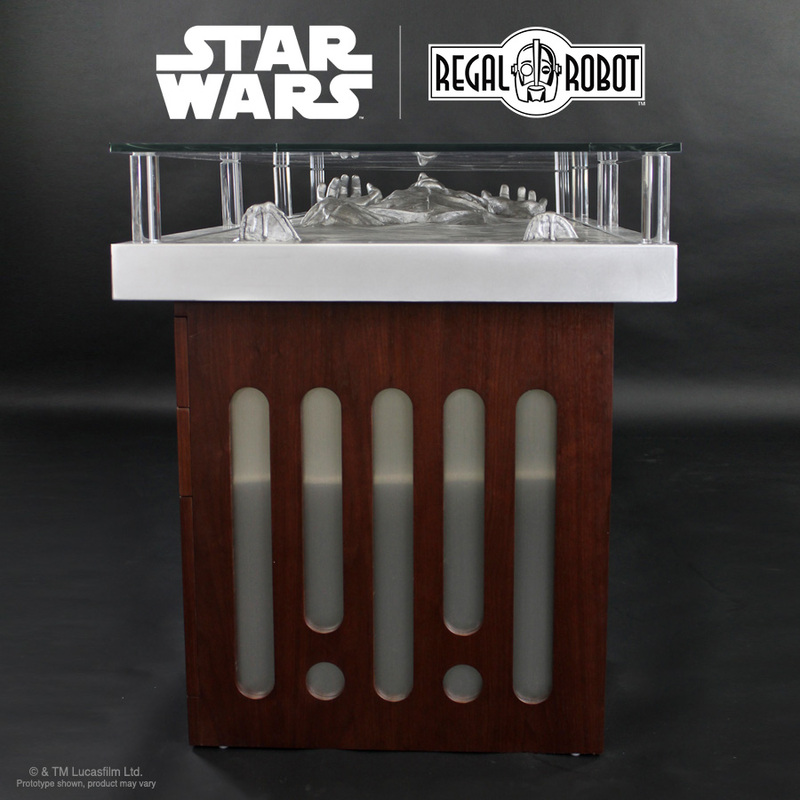 We’re excited to provide Star Wars fans their chance to bring this iconic, bold design into their home or office! Approximate Product Weight -340 lbs. Never move assembled. 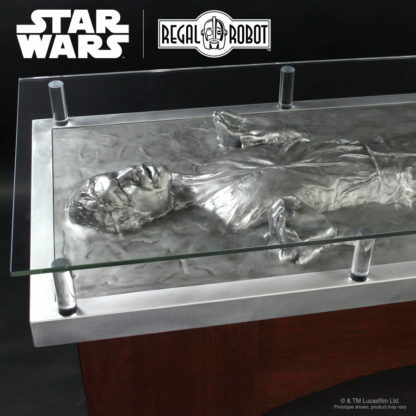 Always remove the glass and aluminum “carbonite” section before moving. Never sit or stand on the glass. Always use the provided rubber bumpers when placing the glass on the table. Minor assembly required – placing the wood portion of the desk, placing carbonite section and acrylic posts, placing the glass (team lift).